One of the fundamental plays of the Oregon offense just got better, while building more options to counter new defensive strategies. It seems that every year we see new play variations devised for when we face Cal, and this year is no exception, as we see a wrinkle on one of the foundation plays that makes us ponder the multiple uses. Coach Helfrich is again showing us flexibility in his play calling for when defenses load up to stop the most basic of Oregon plays — the Inside Zone Read. 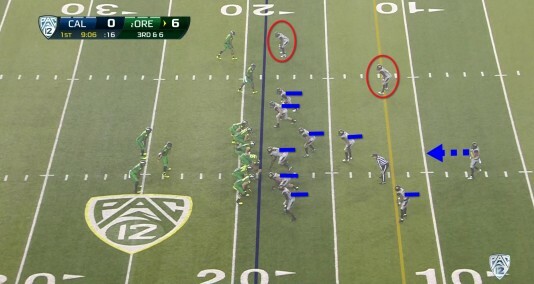 The Straddled Triple Option is one of the base plays of the Oregon offensive arsenal and we see it begin above with a slot back going in motion backward to become the pitch man as one of the three options. Why do I call it the Straddled Triple Option? It is because we are attacking two directions at once, as if straddling a fence of offensive attack. As you see above, the No. 1 option is the Inside Zone Read going to the left, as the QB is Zone Reading the outside linebacker, circled in light blue. The second option is the QB keeping, if that OLB moved to follow the RB, and if the QB gets covered, then he pitches to the No. 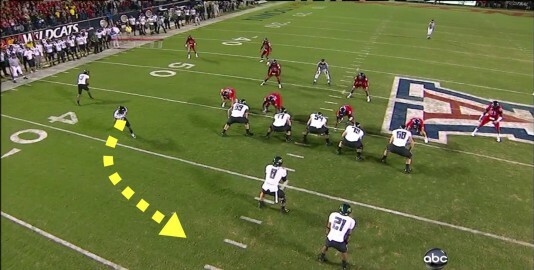 3 option, the trailing slotback. 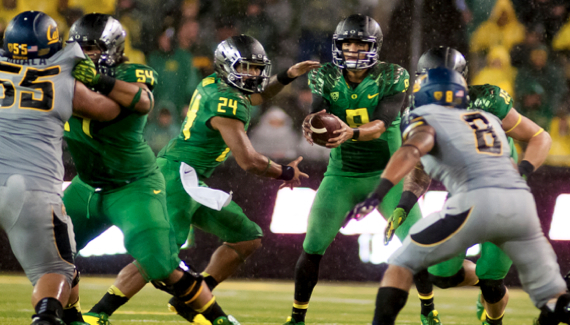 This play has been an Oregon trademark since the Spread Offense arrived in Eugene. 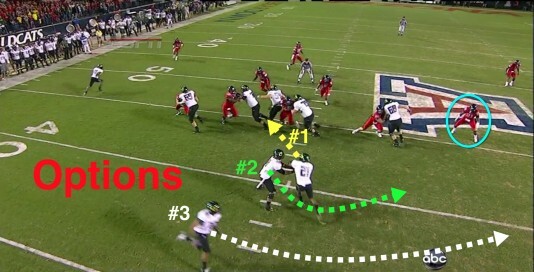 Oregon’s first touchdown (above) is a Straddled Triple Option, but of a different breed. Note how the pitchman (white dotted arrow) is MUCH wider than usual, as in fact he is not in position to take a pitch, but a Bubble pass, instead. As he flares out, he has two blocking WRs, but three Cal defenders counter them. Mariota made the Bubble Zone Read at the beginning of the play and knew he would not be throwing the Bubble pass. 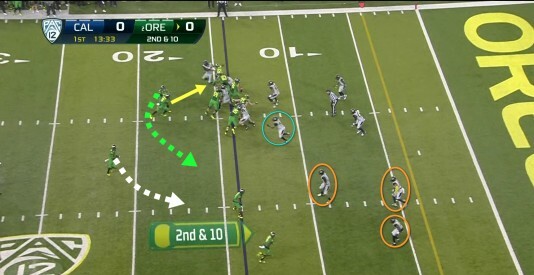 At this moment of the mesh, he is reading the OLB who is “sitting” in the running lane should Marcus take off, thus the correct read is to hand off to the RB for the Inside Zone Read option. The blocking was superb and since an extra defender was out guarding the Bubble, it was easier for Marshall to score because the Ducks had hat-on-hat blocking of those Bears in the immediate defensive box. At the moment of the mesh (above), we note how the defensive tackle and end that Greig and Johnstone are blocking, are concerned about outside contain, thus those two Duck blockers simply drive them backward where they want to go (green and yellow arrows above). 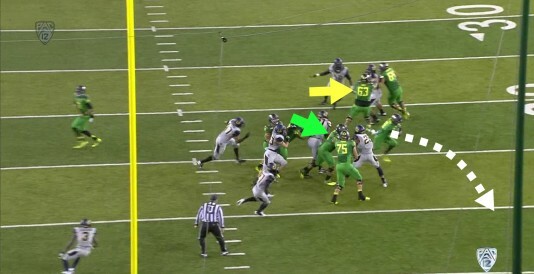 In the yellow circle is Hroniss Grasu, coming out to take on a Cal LB. A perfect running lane has been created, as Mana (No. 63) drove his defender completely out of the play, and Grasu just finished up engaging his LB long enough for Byron to zip by. 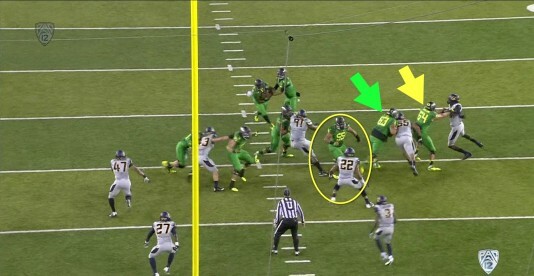 These defensive linemen being blocked by Mana and Tyler, as well as those being blocked on the backside, are not poor players, as Oregon tried to recruit many of these big bears on the Cal defensive line. There has been consternation about Oregon’s lack of interior running game, and yet the Ducks score their first touchdown with an Inside Zone Read against some stout defenders. Since the interior running game has been blocked well, thus far — Cal sells out on defense to stop it (above). The WRs at the top of the screen have man-on-man coverage, while the box has seven obvious defenders. But look at the positioning of the corner on the yellow line (blue dash on him) and the safety in the center of the field, who is coming up. It is apparent that the Golden Bears want to stop the base play of the Oregon offense – and the play that just scored on them minutes before – the Inside Zone Read. The right halfback has gone in motion to the top of the screen, and Marcus and the RB did the mesh for the Inside Zone Read. Look (above) at how the Cal defenders are so focused on stopping Marshall and how the free safety or LBs have not moved quickly enough to counter the Bubble receiver about to catch the pass. 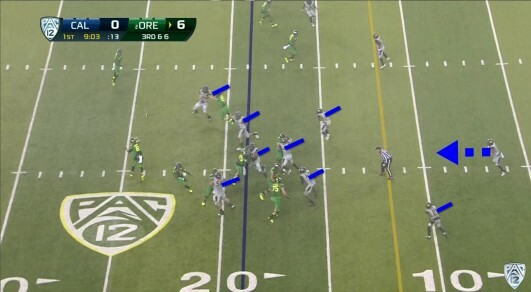 The Duck WRs are moving into blocking position for the Bubble receiver (Huff). Marcus missed some passes this game, but this one was on stride, and we see the best receivers in America in action to create an easy running lane for Huff and thus a touchdown. We see (above) at the top of the screen, the hand fighting for inside blocking position by Lowe (red circle), and the incredible block by Addison putting his defender on the ground. Bralon runs back two punts for touchdowns AND gives his all for his teammates? Wow, what a complete player! My friends . . . I was never worried about the inside running game at Oregon, as I had watched the two new starting guards play a ton last year while making big plays for the Ducks. Teams MUST stop our Inside Zone Read base play, and thus – when they do as Virginia and Tennessee did – it opens up the outside running attack and passing game for Oregon. The variation of adding the Bubble to the Triple Option is not new, but I have not discussed it because I wanted to see such a notable example such as this game to see how it takes advantage of the numbers game going on in the defensive box. Stack up the box to stuff the Inside Zone Read? 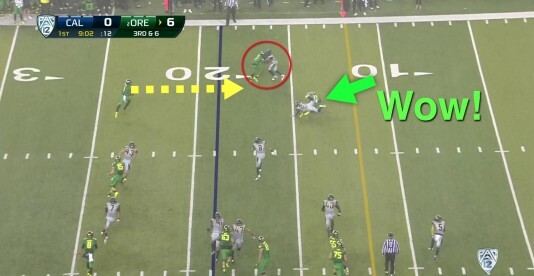 Oregon will counter with outside plays such as this, to continue to rack up the points!